Colin Earl, Ray Dorset, Joe Rush & James Matthews (from Country Jug). 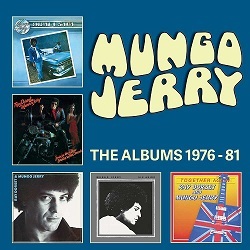 1975-81 – a period that was a successful one, if not in the UK for Mungo Jerry. Ray Dorset and his band, as ever, toured extensively all over Europe and beyond. 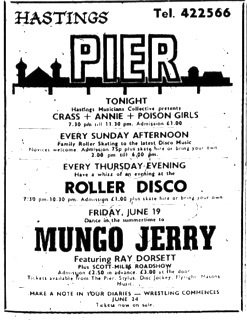 The move from Pye to Polydor saw Mungo Jerry registering several hit singles, numbers such as Cant Get Over Lovin’ You, Hello Nadine, It’s a Secret and Lana. 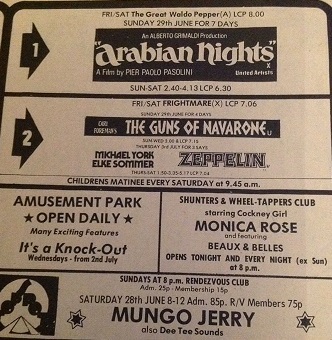 Some of our date sheets are far from complete – only FIVE gigs that we know of for 1975, a handful for 1980 and only NONE for 1981 when the London based Fan Club ended – but we have listed all that we have to hand but are striving to add to the lists as and when we can. “We did a week up in the Newcastle area doing working men’s clubs and that was just absolutely terrible! 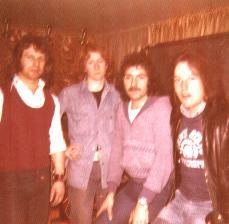 FOUR WEEK FRENCH TOUR: Ist May – June , 1976. 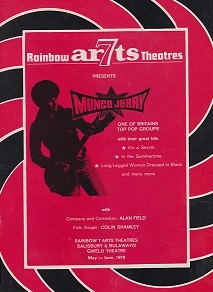 On May 1st, Mungo Jerry did the first gig of their very successful French tour in a packed hall in Yves St.Leger. This was the first time that the band had used their new light show. The band toured all over France for four weeks playing to large audiences in clubs, halls and marquees. They also did several T.V shows in Paris and Cannes, where the new French single, It’s a Secret, currently in the charts, was performed. Hello Nadine is still in the French juke box charts as well as being in the South African charts and Impala Saga is doing very well in Europe. On returning from France, the band did several gigs in England and then went into the studio to record three new numbers. One of the new numbers that they recorded which was produced by Ray Dorset and Alan Blakely is to be the new single released on the Polydor label on the 23rd July, 1976. It is entitled Don’t Let Go. 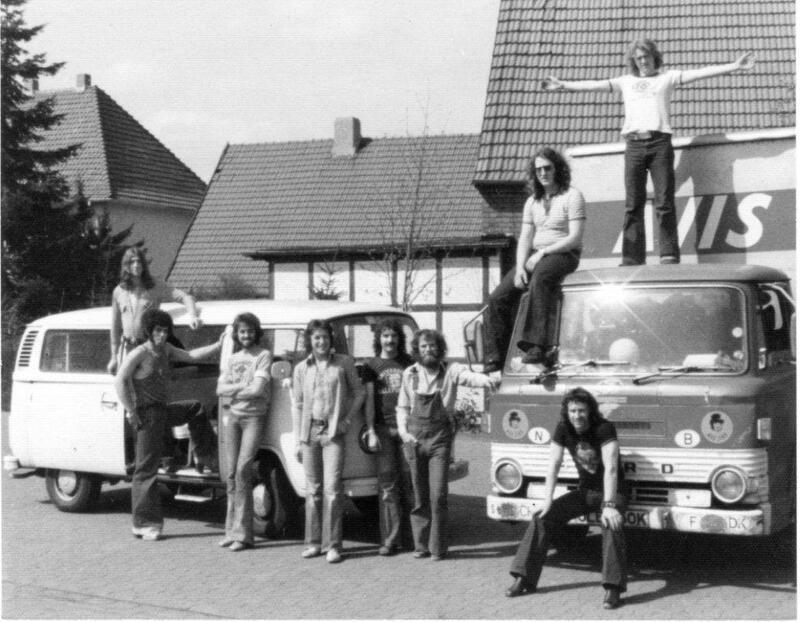 The band then went to Luxembourg to do a T.V show and then returned to France to do three more gigs and a T.V. They are currently working on a new album, and the guys have all been enjoying the good weather. Colin has bought a new house and a convertible E.Type Jag, and Ray has been messing about with his new swimming pool. Joe has been spending most of his spare time at Frenshams Ponds trying out the new boat that he made. L-R; Chris Warnes, Ray Dorset, Colin Earl, Pete Sullivan, Ray ‘Cleggy’ Clegg (Road manager), Joe Rush & roadies ‘Blob’, ‘Bizz’ and ‘Nipper’. MARSEILLE, FRANCE : 13th April, 1977. 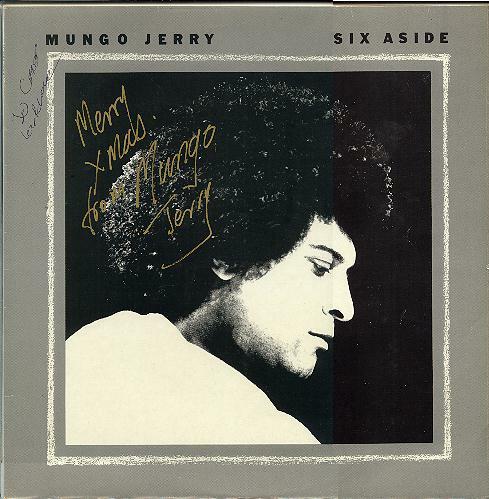 In 1970, Mungo Jerry released the multi-million selling record, In The Summertime. This was the first ever 33 1/3 rpm maxi-single, and now in 1980 to celebrate their 10th anniversary, they have released another 33 1/3 rpm maxi – Mungo’s Summer Fun Package. This contains four tracks: Summertime Holiday, Hooray It’s Party Time, Night On The Town, Really Had a Goodtime. The maxi-single comes in an amazing full colour picture bag and is released on the Scratch/Satellite label. It is available through Pye records (PRT) by courtesy of Hammer records Ltd and will be in record shops from 1st August 1980, order number HS406. A compilation album, Six-A-Side is also available on the Satellite label, this also contains Summertime Holiday and Mungo’s original version of the Kelly Marie hit Feels Like I’m In Love which is currently at 61 in the B.B.C chart. 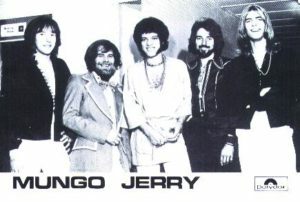 The ten year Mungo Jerry reunion which was held at The Goat, Sunbury On Thames, and featured the current band line-up together with original members Joe Rush and Paul King was such an overwhelming success that repeat performances will be performed. Joe was with the Good Earth along with Ray and Colin after they changed to playing Sun rockabilly and jug band type music but left before the recording of In The Summertime and the subsequent success, although he did appear with the group at the Hollywood Festival and also played on many of their recordings. He was also a member of the King Earl Boogie Band and Country Jug apart from many jazz bands, playing as he does now with Mungo Jerry, double bass, percussion and washboard. Joe likes listening to (and was a member of) Bob Kerr’s Whoopee Band, The Eagles, Ken Colyer and any good country blues, jug bands and vintage jazz. In his spare time, he likes to go to Motor Car and Motor Cycle racing and making radio controlled model boats and aeroplanes. Colin Earl Fan Club Biography…. Colin Earl first began playing piano about 15 years ago when he was an ardent Jerry Lee Lewis fan. 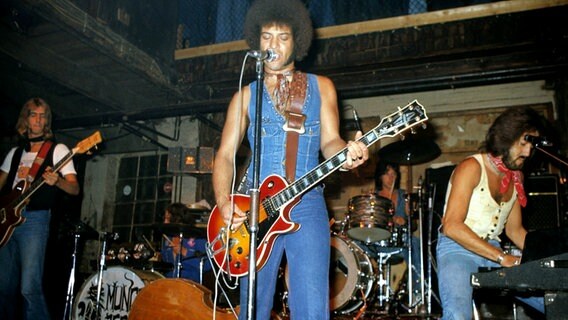 He formed a rock ‘n roll band with Ray Dorset called The Good Earth, a name that the band kept until the release of In The Summertime in 1970, when the name was changed to Mungo Jerry. 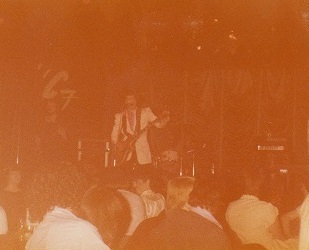 After much success, Colin and Paul King left to form the King Earl Boogie Band, where they recorded and album and a couple of singles before splitting. 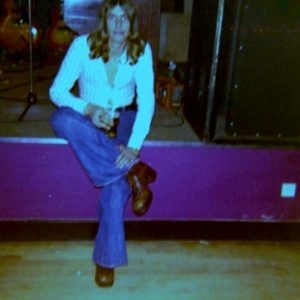 Colin then did some gigs with Joe Rush’s old band Country Jug before leaving for America to tour with his brother’s band, the very successful English/American rock band Foghat. 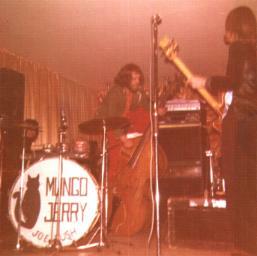 After two years on the road in the States, Colin returned to England and rejoined Mungo Jerry together with Joe. Colin’s favourite kind of music is good early rock ‘n roll, blues and country music played by artists such as The Band, Little Feat, Muddy Waters, Willy Dixon and Commander Cody. Colin is interested in classic sports cars and when he is not playing, he passes his time fishing, playing tennis and messing around with one of his many cars. Chris was born in Lowestoft on the 30th July, and now lives in London. He plays a framus bass and Dan-Electro using Rotosound wirewound short and long scale strings. Chris also plays the violin, drums and bugle. 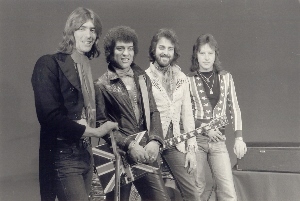 Before joining Mungo Jerry, he played with Proteus, Retaliation, Storm and Crow. Chris admires the playing of Chris Squires and likes listening to any music with a solid beat, especially Yes and Deep Purple. “The line-up with John, Jim and Ian was more rocky than the original line-up that Ray had. If you listen to the Impala Saga album, I think you would agree. “It was great playing with the lads, although it was short lived really, about a year with them. “I carried on playing with Mungo Jerry after this time with Pete Sullivan, Colin Earl and Joe Rush for about three years. All were great times. “One of the funniest experiences I can remember was when we were all down in the South Of France gigging in clubs. “We all had a great tan and good sunburn. We played the gig and went down a storm. Joe managed to get a bottle of champagne…and as we sat in the mini-bus ready to leave, Joe decided to pour the champagne over my head, which in turn soaked into my sunburn. “This was so painful that I jumped up and put a hole in the mini-bus roof! 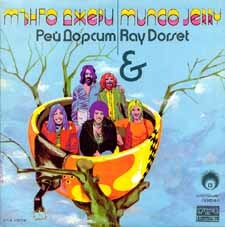 When Mike Cole left Mungo Jerry to form the group Valentine, Pete played drums and later left to join Bronx Cheer (the one-time Pye recording band) who shared the bill with Mungo Jerry on many occasions. When the band’s own drummer became ill, Pete helped out and eventually joined Mungo full time. Pete also plays piano and guitar and likes country music, rock and jazz and the playing of Nigel Olsson, John Hiseman and Jim Keltner, The Eagles, The Band, Poco and Neil Young. Pete is interested in all sports, especially football and watching old films. 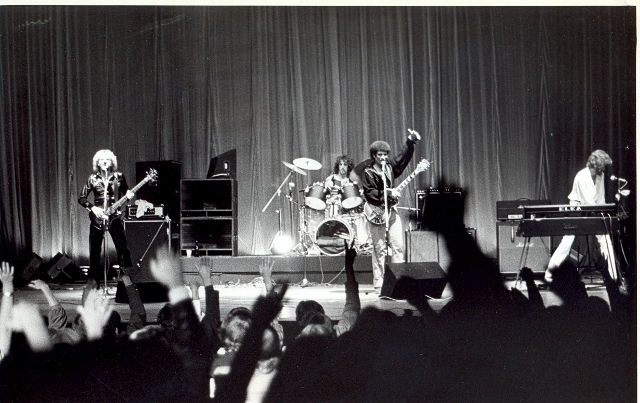 “During June 1978, the four-piece Mungo (Ray Dorset, Colin Earl, Eddie Quinn and Gary Gazelli) achieved the accolade of becoming the first Western rock group to play in Bulgaria. “Complying with a gentle request to ‘change their style of clothes as the authorities are not happy about the effect their leather-clad image might have on Bulgaria’s youth’, the band went down extremely well, and the concert was beamed live to the USSR. “A live LP, Vig was recorded at the Golden Orpheus, and released on the state owned Balkanton label. “Owing to the peculiar copyright situation in Bulgaria, it had ‘official bootleg’ status.